Catholic health care in Australia needs to be "refounded" to respond to the needs of today, including the growing health effects of loneliness, says Marist priest Fr Gerald Arbuckle. Source: Catholic Voice. 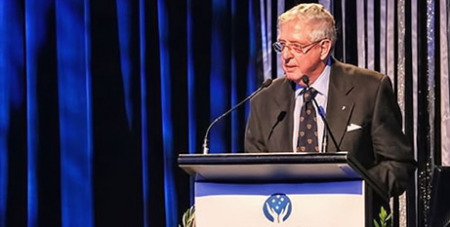 Fr Arbuckle gave a keynote address at the recent Catholic Health Australia conference in Melbourne, in which he said that so much change is taking place in Catholic health care that a "refounding" is required. “What is refounding? It is simply the return to, and re-ownership of, the founding experience of our ministries. For us, the ultimate founding experience is the mission of healing as taught and lived by Jesus Christ,” he said. “By re-owning this experience – with its faith-inspired hopes in the midst of enormous challenges – people are passionately inspired to adapt the founding experience in dramatically new ways to meet contemporary needs. In looking to the future, Catholic health care providers should be alert, as the religious founders of Catholic health services were, to new social and poverty diseases. “Thus, my emphasis, for example, on the growing social disease of loneliness. Our mission of healing calls us to discover ways to respond to this disease,” Fr Arbuckle said. “Loneliness is an inescapable and painful fact of human experience. Loneliness is not only afflicting adults. It is on the rise among teenagers. “There are two qualities that mark loneliness. People feel excluded and rejected. At the same time they yearn to be intimately in contact with others. Yet, not only individuals experience this loneliness. Cultures do also. Entire cultures can feel politically, economically or socially excluded and oppressed. Fr Gerald suggested Pope Francis’ call for a “revolution of tenderness” is the antidote to the loneliness epidemic, a revolution which can begin with something as small as a friendly greeting.